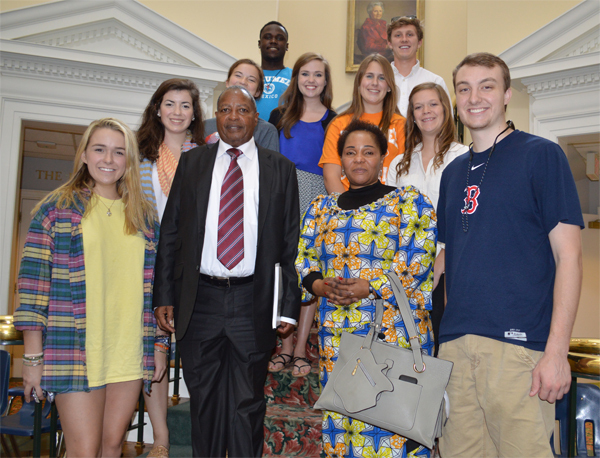 Samford University hosted Tanzanian official Dr. Willibrod Peter Slaa for a discussion of development in his country Oct. 4. Slaa is Secretary-General of Tanzania’s CHADEMA Party, a 2010 presidential candidate and an Honorable Member of Parliament of the United Republic of Tanzania. Slaa and wife Josephine (left, with Samford students) were in the state at the invitation of the Alabama Department of Commerce and Birmingham-based Fusion Advisory Services. Samford’s Office of Diversity and Intercultural Initiatives, the Office of International Education and the Project Africa Now! club arranged the Samford event. Slaa made special note of Samford’s Christian mission and expressed his hope that religious faith could help end public corruption in Tanzania, a central aim of his party. Although Tanzania is a resource-rich country, with a large amount of natural gas reserves as well as precious metals and gemstones, Slaa said the country is impoverished, largely by corruption. He also said that foreign investors often exploit the nation’s resources but create no jobs or other benefits for the people of Tanzania. His vision for Tanzanian development is founded on “equitable partnerships” with investors, especially in the fields of education and green energy. Slaa sees in the “Asian Tigers” a lesson for Tanzania. He said nations such as Malaysia and Singapore invested in education soon after achieving independence, and eventually rose from poverty to become leaders in technology. He believes Tanzania can follow a similar economic route by empowering its people.